Here's some trivia gleaned from various sources - edited and with no names included unless strictly necessary! Much of it is not related to the actual school but may be of interest...... 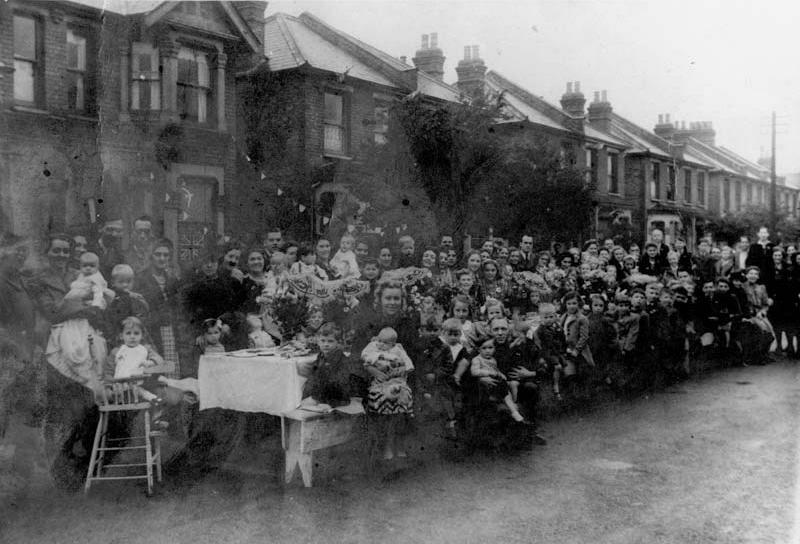 LINKS WILL OPEN IN A SEPARATE WINDOW For Memories of Wartime - CLICK HERE For Subway Memories - CLICK HERE Jack Doughty came across this photo of the Victory Party in Farnham Road, Seven Kings, presumably 1945. Some children living in Farnham Road went to Downshall and some to the William Torbitt. Click on the image to see more....... For information regarding the refurbishment of William Torbitt's grave CLICK HERE Click on the picture to see a School Report from 1946/47 St Peter's Church at Aldborough Hatch now has it's own website - www.stpetersah.org.uk CLICK HERE for 1953 - Coronation Day Street Party - Bawdsey Avenue Girls Life Brigade Camp Group, Herne Bay 1950 1954 Sunday School Anniversary, Oaks Lane Methodist Church City Coaches CLICK HERE for a peep at the first Intake Register for the school 1st Aldborough Hatch Scouts 1953 - it's a big picture - 85k - so Be Prepared! PLEASE don't send in identifications for this pic! CLICK HERE FOR THE PICTURE OF The Duchess of York (later to become the Queen Mother) leaves the Super Cinema, 21 October 1926. The bear was a gift for Princess Elizabeth from the children of Ilford. The Mayor, Frederick Wise, and the Duke of York (later King George VI) are also shown - and that's William Torbitt on the left. Picture with thanks to Bill Torbitt CLICK HERE FOR THE PICTURE of Charlotte and Anna Torbitt (the great granddaughters of William Torbitt) at home in Namibia holding a beautiful silver plate, given by the staff of the Ilford Education Department to William Torbitt on his retirement in 1938 shortly after the school was founded. (plus detail of plate). Picture with thanks to Bill Torbitt Aldborough Stores - source of the legendary penny crisps! Click here for memories of "the white hut", on the Oaks Lane Estate. Many of the pupil's fathers had a hand in the construction - it was a self-build thing for the residents of the new council estate and became their Community Centre and was the headquarter's of the 2nd Aldborough Hatch Cub/Scout troop. It was used for whist drives, parties and wedding receptions and is now used by the Salvation Army. Trolleybus pictures circa 1959 Yvonne Whitney became a Baptist minister. 1965 - School photos cost one shilling (1/- or today’s 5p), but you could splash out on great huge ones for 2/6! Here's some trivia gleaned from various sources - edited and with no names included unless strictly necessary! Much of it is not related to the actual school but may be of interest...... LINKS WILL OPEN IN A SEPARATE WINDOW For Memories of Wartime - CLICK HERE For Subway Memories - CLICK HERE Jack Doughty came across this photo of the Victory Party in Farnham Road, Seven Kings, presumably 1945. Some children living in Farnham Road went to Downshall and some to the William Torbitt. 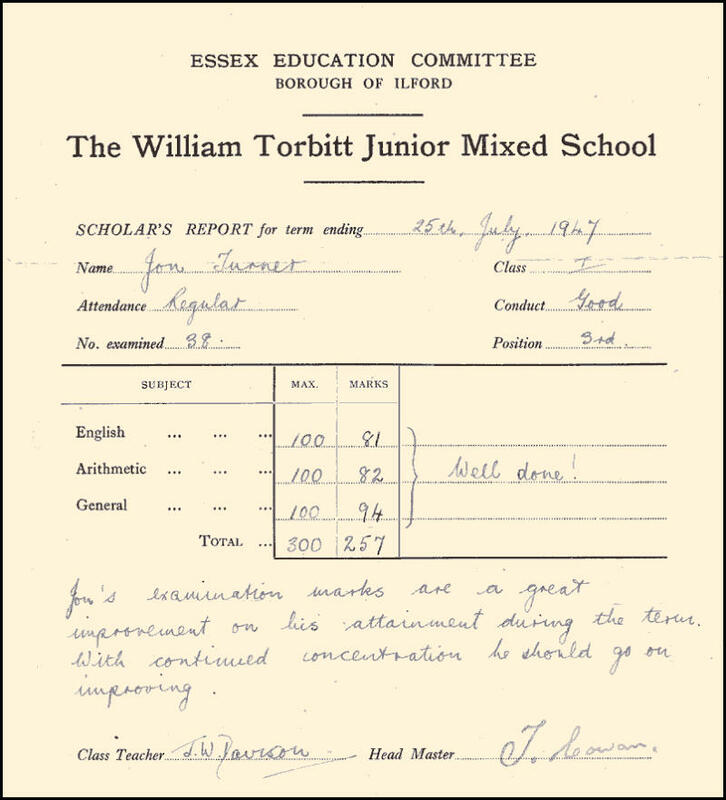 Click on the image to see more....... For information regarding the refurbishment of William Torbitt's grave CLICK HERE Click on the picture to see a School Report from 1946/47 St Peter's Church at Aldborough Hatch now has it's own website - www.stpetersah.org.uk CLICK HERE for 1953 - Coronation Day Street Party - Bawdsey Avenue Girls Life Brigade Camp Group, Herne Bay 1950 1954 Sunday School Anniversary, Oaks Lane Methodist Church City Coaches CLICK HERE for a peep at the first Intake Register for the school 1st Aldborough Hatch Scouts 1953 - it's a big picture - 85k - so Be Prepared! PLEASE don't send in identifications for this pic! CLICK HERE FOR THE PICTURE OF The Duchess of York (later to become the Queen Mother) leaves the Super Cinema, 21 October 1926. The bear was a gift for Princess Elizabeth from the children of Ilford. The Mayor, Frederick Wise, and the Duke of York (later King George VI) are also shown - and that's William Torbitt on the left. Picture with thanks to Bill Torbitt CLICK HERE FOR THE PICTURE of Charlotte and Anna Torbitt (the great granddaughters of William Torbitt) at home in Namibia holding a beautiful silver plate, given by the staff of the Ilford Education Department to William Torbitt on his retirement in 1938 shortly after the school was founded. (plus detail of plate). Picture with thanks to Bill Torbitt Aldborough Stores - source of the legendary penny crisps! Click here for memories of "the white hut", on the Oaks Lane Estate. Many of the pupil's fathers had a hand in the construction - it was a self- build thing for the residents of the new council estate and became their Community Centre and was the headquarter's of the 2nd Aldborough Hatch Cub/Scout troop. It was used for whist drives, parties and wedding receptions and is now used by the Salvation Army. Trolleybus pictures circa 1959 Yvonne Whitney became a Baptist minister. 1965 - School photos cost one shilling (1/- or today’s 5p), but you could splash out on great huge ones for 2/6!